€450m Dublin Dockland Developments is a go! Dublin City Council (“DCC”) has granted planning permission for a development comprising 18,000 sq. m. of office space and 100 apartments at 5 Hanover Quay, Dublin 2. It is the second grant of planning permission since the area was designated a Strategic Development Zone (“SDZ”). Last month, DCC approved the construction of 9,300 sq. m. of office space and 58 apartments at 76 Sir John Rogerson’s Quay, Dublin 2. Funds managed by Los Angeles headquartered alternative investment manager, Oaktree Capital Management, L.P. (“Oaktree”), Irish-based property and construction organization Bennett Group and NAMA have invested together in the South Docks Fund (the “Fund”) of Targeted Investment Opportunities plc (“TIO plc”), an umbrella fund with segregated liability between sub-funds of which Oaktree Capital Management (UK) LLP is the Investment Manager and Bennett Property Limited is the Asset Advisor. TIO plc has been regulated by the Central Bank of Ireland since 2 July 2013. TIO plc submitted planning applications to DCC last December on behalf of the Fund. Combined, the end-value of the developments (branded as ‘The Reveal Developments’) will be approximately €450m. Upon completion, they will accommodate up to 2,400 workers and 158 apartments. Savills Ireland and DTZ Sherry Fitzgerald have been appointed as letting agents for the schemes. Construction costs will be approximately €140m. Brendan McDonagh, Chief Executive of NAMA, said: “This is an important step in delivering a project that will bring much-needed quality office space and residential accommodation to the Docklands and deliver a commercial return for the taxpayer. It highlights the benefit of the SDZ designation and faster planning process in delivering high-quality projects quickly”. 76 Sir John Rogerson’s Quay, Dublin 2, will comprise 9,300 sq. m. of office space and 58 one-, two- and three-bedroom apartments located above ground level. Separate office, retail and café units will be located at ground floor level offering active frontage onto the future ‘Chocolate Park’ which is due to open next summer. The Park – which is situated between Hanover Quay and Sir John Rogerson’s Quay – will provide a new leisure space for workers and residents at Grand Canal Dock. 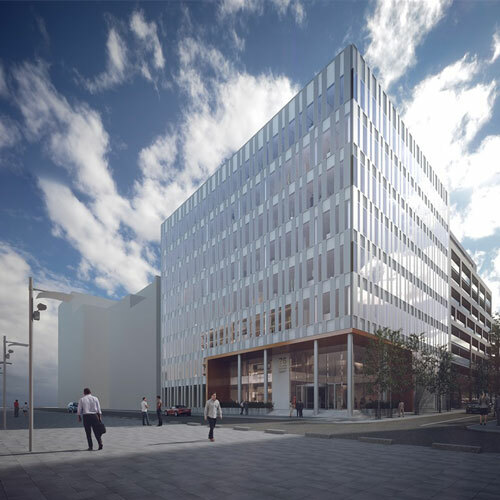 5 Hanover Quay, Grand Canal Dock, Dublin 2, will provide 18,000 sq. m. of office space and 100 one-, two- and three-bedroom apartments in the form of a u-shaped block connected to the eastern side of the office building. At ground floor level, there will be a mix of leisure, café, retail and own door office units. The residential element of the building will also have prime views towards Grand Canal and the future Chocolate Park.